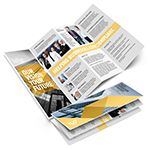 Brochures are a staple marketing strategy for good reason. Hand them out on trade shows, display them at your store counter, or give them away at a pop-up store event. Versatility is the name of the game when you print and give out brochures to people. 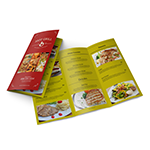 We print and deliver brochures on the same day that you place your order. We value your business and personal time that is why we offer this product with this unique feature. Place orders and finish design proofs before 10am and get your brochures the next day. Note: All sizes on the calculator are measurements before folding. As the name implies, the trifold divides your brochure into three vertical panels. This fold allows your customer to take in information in a specific sequence. This fold divides your brochure into three vertical panels into its distinctive “Z” shape. Each panel folds on top of one another and efficiently presents the different features of a product or service. 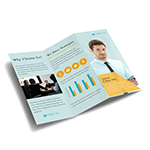 This brochure has a three-panel design where the two front panels fold inward to form the “gate.” The front panels can reveal an image or infographic that unveils a new offer from your business. The accordion fold divides your brochure into four panels that fold on top of one another. This option unfolds information in an organized and sequential manner. The double parallel fold divides your brochure into four panels that are parallel and stand in the same direction. Give customers a detailed look of your company or categorize different product offers. This fold divides your brochure into four panels. The paper is folded in half, and then folded again perpendicular to the first fold. The total space is large enough to show photographs of your products. This fold divides the brochure into four vertical panels. Use the long height per panel to showcase your services in detail. 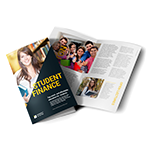 Our fast and cheap brochure printing service offers four premium paper stock options. The 70 lb. and 80 lb. stock are both lightweight and easy to hand out at events. We also have a 100 lb. paper stock that’s thicker and more durable. The 10 lb. cardstock is slightly thicker and more durable than paper. Note: Both paper and 10 pt. cardstock are folded before shipment. Read up on paper and cardstock here. Our gloss and matte coating options bring out particular details of your images and text. Gloss coating on both sides adds some shine without glaring against the light. If you need the colors to pop and don’t mind the extra shine, select the high gloss UV coating. Brochures with high UV coating can also withstand repeated handling. Matte coating has a satin-like texture and its smooth surface keeps the customer reading through several images and a lot of text. How to design and print your brochures online? Upload your design or create a new one using our online brochure design tool. Print brochures today and they will be folded, packed, and ready for shipping as soon as today. Note that our printing turnaround is the number of printing days. Avail of our free proofing to make sure your order is correct before they are shipped. What does “printing turnaround” mean? "Printing turnaround" is the number of days allotted to print your order, but it does not include weekends and holidays. Shipping transit time is not included in turnaround time. What printing and shipping options should I choose for a rush order? Select “Ready Today” as your printing turnaround so that the design will be ready on the day itself. After selecting this, enter your ZIP code under “Delivery Options” to get an estimate and see the fastest shipping times for your order. You can choose from one-day delivery dates. Some locations have next day pickup dates available as well. What is the difference between gloss and high gloss UV coating? High gloss UV has a high shine finish that appears wet when applied on deep, dark colors like black and blue. The high gloss UV coating is abrasion resistant and able to withstand frequent handling. Gloss coating also has a shiny surface and reflects light off your design. Unlike high gloss UV, however, gloss coating absorbs dust, fingerprints, and smudges. What are the most popular brochure sizes and their main uses? 2-fold: 8.5” x 11” - Primarily used to introduce a specific product or service. 3-fold: 8.5” x 11” and 11” x 17” - Presents longer lists or detailed information in a sequence. 4-fold: 8.5” x 14” - Provide more space or larger areas for images and infographics to showcase blocks of information in an organized manner. Why should I use the free proof? Selecting the free proof lets you check the design before it is printed. We highly recommend this for individuals under a rushed timeline or those with specific printing concerns on their file. It’s also recommended to customers who are new to getting designs printed or using NextDayFlyers. Our customer service team will be available to address any concerns regarding the proof. Brochure Printing is rated 4.9 out of 5 by 156. Rated 5 out of 5 by Anonymous from Great Quality I bought this brochure for a club event and it came out just as I expected. Rated 5 out of 5 by Shawn from You made me look good The Trifolds were incredible. The artwork, the paper, the overall job was excellent. I am very satisfied. Rated 5 out of 5 by BolSusie from Turned out as expected! Always a pleasure to work with you..can depend on getting exactly what I presented, on time, if not earlier.